We CIPANGO recently revisited Nishiawakura village in the deep snowy winter. We witness the breathing of each YOUBI staff in the atelier working hard on their wood works while inhaling pleasant Hinoki aroma from the wood materials. The Windsor chair is originally one of the oldest style of chair originating from England, and has been beloved around the world until today. Youbi’s dream to create a new type of Windsor chair connected to their precious forest has now been achieved. 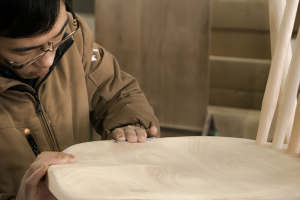 We went to document the process of how they delicately plane and file the Hinoki wooden seat of the newly born ITOSHIRO WINDSOR.